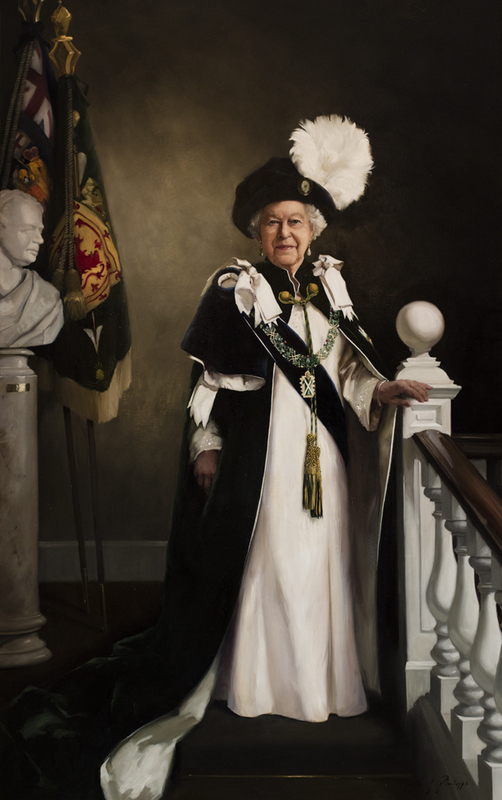 New portrait of Her Majesty The Queen by Nicola Jane (Nicky) Philipps, commissioned by The Queen’s Body Guard, Royal Company of Archers. The Queen’s Body Guard for Scotland, Royal Company of Archers has commissioned a portrait of Her Majesty The Queen to mark The Queen’s 90th Birthday, which has been painted by the artist Nicky Philipps. 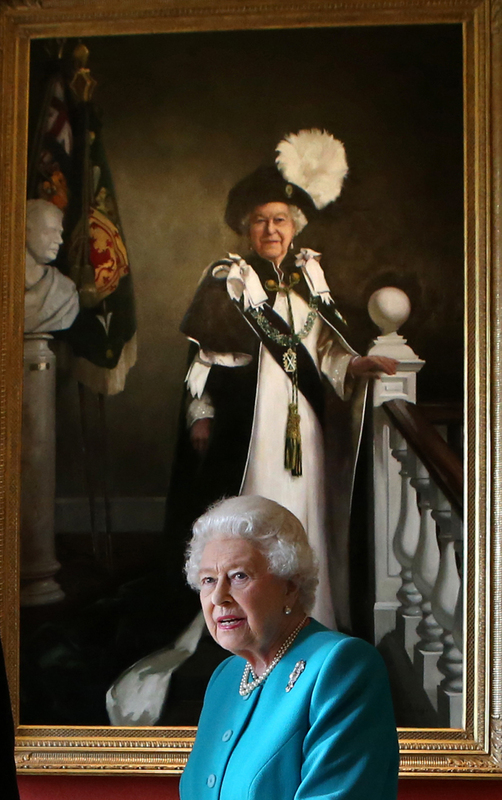 The Queen is wearing the robes of The Most Ancient and Most Noble Order of the Thistle and is depicted standing at the top of the staircase in Archers’ Hall. The picture includes a bust of Sir Walter Scott who was instrumental in establishing a ceremonial role for the Royal Company for the visit to Scotland by King George IV in 1822. Also included in the picture are the Colours of the Royal Company which were presented by The Queen in 1966. The portrait is full length and will hang in the dining room in Archers’ Hall. The Royal Company was established in 1676 to participate in, and promote, archery. With the approval of King Charles II, it was authorised to bear the name The King’s Company of Archers. In 1704 Queen Ann granted a Royal Charter which entitled the name to be changed to The Royal Company of Archers. Following the royal visit of King George IV in 1822, the name changed once more to The King’s Body Guard for Scotland, Royal Company of Archers. The Royal Company continues to participate in longbow archery and one of the most important competitions is for The Queen’s Prize which is presented by Her Majesty at the Palace of Holyroodhouse to the winner each year. A 30 yard indoor archery range was recently constructed at Archers’ Hall which is used not only by members of the Royal Company but also by university students, disabled veterans and other archery clubs. The portrait of HM The Queen was painted by Nicola Jane (Nicky) Philipps from a sitting with Her Majesty at Windsor Castle on March 18th 2016. On meeting Lieutenant Colonel Callander, Secretary of the Royal Company of Archers at Archers’ Hall to discuss the preferred composition of the painting, Nicky was delighted to discover a portrait of her great, great grandfather on permanent display in the Dining Room. Nicky is perhaps best known for her portrait of Their Royal Highnesses Princes William and Harry, commissioned by The National Portrait Gallery, London and her portrait of Her Majesty The Queen for the Diamond Jubilee commemorative first class stamp, now on permanent display in the Throne Room at Buckingham Palace. The image may be used free of charge for a month from release, until 7 August 2016. For use or reproduction in any format on any platform after this date, please refer to Royal Communications for approval and Sara Stewart of Fine Art Commissions ([email protected]).